Located in the back of the brain, recognition networks enable us to identify and interpret patterns of sound, light, taste, smell, and touch. These networks enable us to recognize voices, faces, letters, and words, as well as more complex patterns, such as an author’s style and nuance, and abstract concepts like justice. Recognition networks are specialized networks to sense and assign meaning to patterns we see. They enable us to identify and understand information, ideas, and concepts. 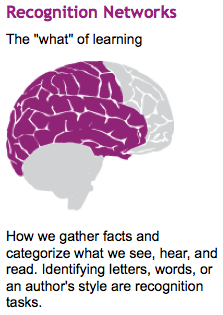 Download BrainNetworks_handout and use it to take notes as you learn about each of the brain networks. Select the following link to the CAST online module about recognition networks. Read about recognition networks then continue to the next page “Classroom Examples: Differences in Recognition” to review classroom applications of the recognition network. What do recognition networks enable us to do? What is the affect of individual differences on recognition networks? What are the implications of this information for teaching and learning in your classroom?